Taurine (non-essential amino acid) strengthens the heart muscle, boosts vision, and helps prevent macular degeneration. Taurine is the key component of bile, which is needed for the digestion of fats; useful for people with atherosclerosis, edema, heart disorders, hypertension, or hypoglycemia. 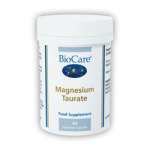 It is vital for the proper utilization of sodium, potassium, calcium and magnesium. 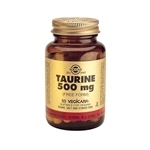 Taurine helps prevent the development of potentially dangerous cardiac arrhythmias. It has been used to treat anxiety, epilepsy, hyperactivity, poor brain function, and seizures.